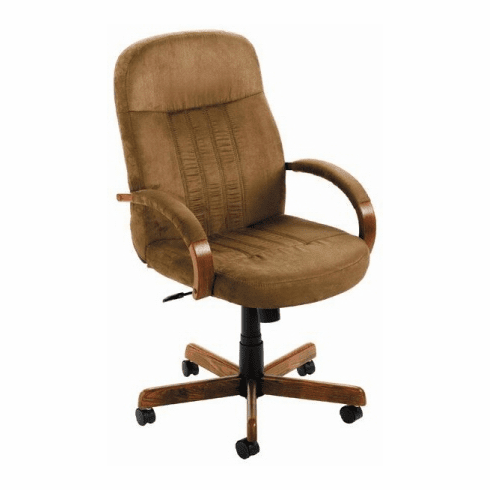 This executive series office desk chair from Boss Office Products is upholstered in a durable and attractive cappuccino microfiber with a dark oak wood finish. This office desk chair also features passive ergonomic seating with built in lumbar support, adjustable tilt tension control, upright locking position, pneumatic gas lift seat height adjustment, 360° swivel, executive high back design, padded and upholstered hardwood arms and a 27" steel leg, wood covered base with double wheel, hooded casters. Dimensions: Seat size: 20"W x 19"D. Back size: 20"W x 24"H. Seat height adjustment: 16.5-20"H. Fully warranted by Boss Office Products. These microfiber office desk chairs normally ship within 2-3 business days from our GA or CA warehouse.